Miners Cottage in Clowne, near Chesterfield, Derbyshire sleeps 2 people. Miners Cottage near Chesterfield is a wonderful converted annexe which is located in Stanfree, a semi-rural location in Derbyshire close to Clowne, Chesterfield and Bolsover. Attached to the owner’s home, this one bedroom property offers good-quality accommodation for a couple looking for a peaceful break. 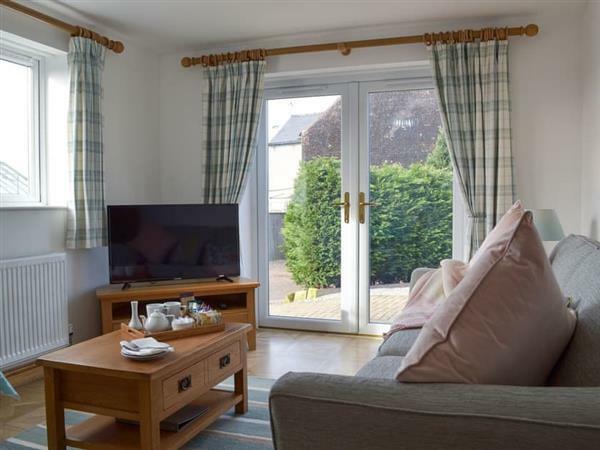 Conveniently all on the ground floor, the cottage has a light and airy living room, lovely fitted kitchen, a double bedroom and a wet room. With a private garden area and patio, there are plenty of opportunities to enjoy summer evenings. Within 50 yards is a public footpath and a gateway to many exciting walks through the lovely countryside. Close to Bolsover Castle and the historic town of Chesterfield, with its famous twisted church spire, this cottage is ideally placed for exploring the surrounding area. If you fancy heading out a little further afield, the renowned walking area of the Peak District National Park is within a short drive, whilst the famous Sherwood Forest is just 12 miles away. The shop, pub and restaurant are all 1 mile from Miners Cottage near Chesterfield. Living/dining room: With Freesat TV, DVD player and patio doors leading to patio. Kitchen: With electric cooker, microwave, fridge, dishwasher and tiled floor. Bedroom: With king-size bed and Freesat TV. Gas central heating, electricity, bed linen, towels and Wi-Fi included. Welcome pack. Small garden with patio and garden furniture. Private parking for 1 car. No smoking. Holidays at Miners Cottage run from Monday to Monday. For a better idea of where Miners Cottage is, you can see Miners Cottage on the map below. Miners Cottage is in Derbyshire; should you be on the lookout for a special offer, you can find all the special offers in Derbyshire. It's always worth checking to see what is on offer at the moment. Do you want to holiday near Miners Cottage (UKC3889), you can see other cottages within 25 miles of Miners Cottage; have a look to find your perfect holiday location.